STOCKHOLM -- Sweden is holding a general election Sunday, the first since the country took in a record number of migrants from the Middle East and Africa in 2015 on top of the hundreds of thousands admitted before. 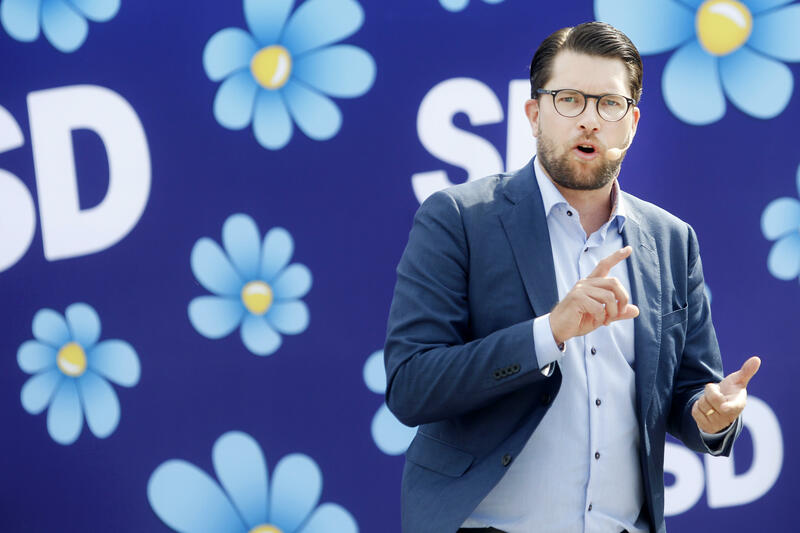 While the borders are now largely closed, a backlash against the earlier open-door policies is set to give historic gains to the Sweden Democrats, an anti-immigrant party with neo-Nazi roots. The center-left government is expected to take a battering. But after Sweden took in 163,000 migrants in 2015 alone -- the largest number per capita of anywhere in Europe -- Prime Minister Stefan Lofven conceded it could no longer cope with the influx. Though border controls have been tightened, many Swedes feel shaken by a rising sense of insecurity fueled by reports of rapes, car burnings and gang violence in migrant neighborhoods. Some also express anxiety that Sweden is losing its cultural heritage. "A lot of people are fed up with the immigration that we have, because it's too many people. But you don't want to say it openly if you don't know who is listening," said Marianne Froberg, a 72-year-old who supports the center-right Moderates. That longstanding taboo, however, is now disappearing. The vote is being watched internationally to see how well the once-fringe Sweden Democrats do amid a populist surge in Europe. In Germany, Austria and Italy -- countries that have received large shares of migrants -- populist, anti-migrant parties have made strong electoral gains since 2015. Sweden's economy is strong, and unemployment has gone down to around 6 percent. Health care, education and climate change are among issues at stake -- but even those are sometimes viewed through the filter of migration. Voters are complaining that waits are increasing at clinics and hospitals, with some blaming that on the many newcomers. Sweden's liberal abortion law has also become an issue because the Sweden Democrats have proposed to lower the legal limit for abortions from the current 18 weeks to 12, sparking fears by some that it would erode women's rights. The main contenders are the center-left Social Democrats, who have dominated Swedish political life for a century and are credited with building Sweden's welfare state. They are led by 61-year-old Lofven, the prime minister, who is governing in a coalition with the Green Party. The center-right Moderates, led by Ulf Kristersson, 54, have long been the country's second major political force. Kristersson became party leader last year and has been in parliament since 2014. Over the past four years the Moderates were the largest of four members of the opposition bloc, the Alliance. Akesson, a former leader of the party's youth branch, was elected to parliament in 2010. Support for the Sweden Democrats has swollen to around 20 percent -- up from the 13 percent it won in 2014. While 20 percent would not be enough for the party to lead a government, a strong show of support will give the party greater power to pressure the next administration. Swedes will elect lawmakers to four-year terms in the 349-seat parliament as well as to local offices in cities and municipalities on Sunday. Polls will open at 8 a.m. local time (0100 Eastern) and close at 8 p.m. (1300 Eastern), though some Swedes have already taken part in early voting that began Aug. 22. Some 7.5 million registered voters will choose from almost 6,300 candidates countrywide. A party must pass a 4-percent threshold to enter parliament. With several parties in the running, it's highly unlikely that any single party will get a majority, or 175 seats, and it could take weeks or even months of coalition talks before a government is formed.